Novice to Olympian we work with our patients to achieve their performance goals. Dr. Kevin Aitken is a Chiropractor and owner of Edge Chiropractic & Sport Therapy. In addition to a Doctorate of Chiropractic, Dr. Aitken is a Fellow of the College of Chiropractic Physical & Occupational Rehabilitation. For over ten years, Dr. Aitken has been a lead instructor and practitioner of Active Release Techniques (ART) traveling around North America to teach at seminars to other doctors, physiotherapist and massage therapists. Dr. Aitken is one of the few chiropractors in Canada that is trained in the OTZ (One-to-Zero) in evaluation and care to improve nervous system function including migraines, insomnia, frozen shoulder. 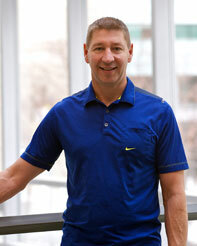 An avid competitor, Dr. Aitken is well respected by many in his athletic pursuits in a variety of endurance sports. A 12 time finisher of the Ironman races, including the World Ironman Championship in Kona, Hawaii, Dr. Aitken continues to compete in marathons and the ultra race, Powderface42 and the 125km Canadian Death Race.